The vast scope of genomics highlights the seemingly unparalleled opportunity to develop new treatments for any number of diseases. One application is precision medicine, which uses a patient’s genetic information to select the most suitable treatment option for illness. Falling costs of genetic testing have made genomics-based analysis and treatment more affordable for the masses. On April 9, 2019, we listed the Global X Genomics & Biotechnology ETF (NASDAQ:GNOM) on Nasdaq. GNOM seeks to track the Solactive Genomics Index, which focuses on companies that potentially stand to benefit from the increased use of genomic technology and science. This includes companies whose principal business is in genomic sequencing, computational genomics and genetic diagnostics, genetic medicine/therapies, gene editing, and biotechnology. When the human genome was first sequenced, researchers attained unparalleled insight into our species’ genetic blueprint. For the first time ever, scientists and medical practitioners could analyze and interpret the biological pathways that influence our appearance, behavior and susceptibility to illness. Completion of the National Institutes of Health (NIH) and Department of Energy-funded Human Genome Project in 2003, which sequenced the DNA of a handful of early volunteers, was estimated to have cost $3 billion. Now, nearly two decades later, one can sequence his or her DNA for around $100, giving rise to a rapidly emerging industry and field of study around genomics. Waves of investment and R&D have poured into the space to further understand and treat various genetic disorders, complex diseases and medical conditions. In 2015, President Barack Obama dedicated $200 million in the national budget for the NIH to sequence the genomes of 1 million volunteers.1 Ultimately, it is believed that a greater understanding of our genetics will empower doctors to conduct more complex medical diagnostics and offer personalized treatments based on an individual’s unique genetic sequence. Such advancements would represent a monumental leap in health care, enabling people to live longer, healthier lives. 1. Potential to cure the previously incurable: For many diseases, advances in genomics could offer the first genuine opportunity to cure illnesses previously deemed fatal or without recourse. Scientists have identified more than 50,000 genetic diseases caused by a single gene mutation in humans, known as Mendelian diseases, which are likely to be the first treated through genomics.2 With improved understanding of gene expression and protein pathways, many more therapies will be tested and proven in humans. Some people, for instance, have already had their vision restored with gene therapy after succumbing to inherited, gradual blindness.3 Gene therapies began to receive US FDA approval in 2017, and human clinical trials for myriad diseases are in progress around the world. While a truly comprehensive understanding of genetic variation in humans is still far away, the vast scope of genomics highlights the seemingly unparalleled opportunity to develop new treatments for any number of diseases; such potential suggests that genomics’ total addressable market (TAM) could continue to grow rapidly, and for a long time, as each new use case is identified. 2. Medicine no longer one-size fits all: Precision medicine, also commonly referred to as personalized medicine, uses a patient’s genetic information to select the most suitable treatment option for illness. While doctors have asked patients for their family history for quite some time now, advances in genome sequencing and bioinformatics make access to this information much more readily available and accurate. Conceptually, it’s not hard to imagine why this approach would be useful. For example, many people have the same type of cancer and undergo the same treatment, yet only some will go into remission, while others will not. Within and across those groups, patients often experience different treatment-related symptoms along the way. Precision medicine seeks to narrow the dispersion of these outcomes by leveraging a better understanding of one’s genes, alongside, of course, assessments of other factors such as his or her micro-biome, behaviors and relevant environmental risks. Greater insight into the genetic variation in humans should therefore help explain why some treatment approaches are better or worse than others for any individual. This visibility may one day help doctors develop completely customized treatments that are rapidly designed and flexibly manufactured for each patient. 3. The falling costs of genetic testing: Greater scale, more computing power, and ever-growing data sets, have made genomics-based analysis and treatment more affordable for the masses. 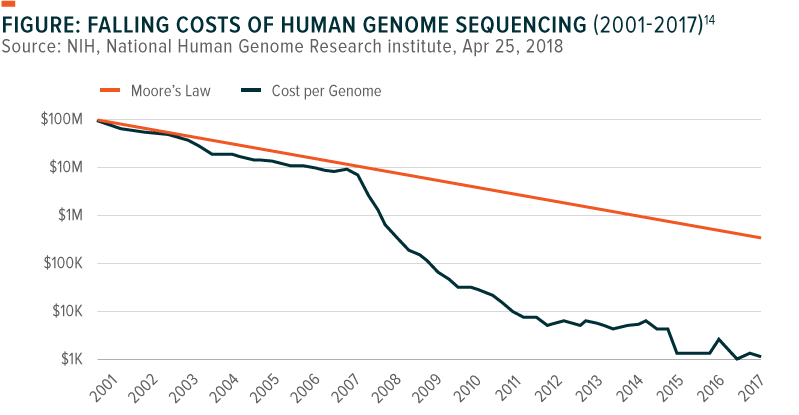 The total cost of sequencing per individual human genome has fallen from $100m in 2001 to under $1k, a pace that has demolished the expectations of Moore’s law. These rapidly falling costs accelerated in 2008 given advances in sequencing technology.12 Even now, new methods continue to be developed for faster, more efficient sequencing. Nano-pore sequencing, for example, which uses pocket-sized machines to decode single strands of DNA ratcheted through a pore one nanometer wide, is among the latest techniques that will help scientists and medical practitioners gather actionable insights in the field, in real-time.13 Decreasing costs of all kinds of genetic testing have already made sequencing readily available to consumers via a simple online purchase of a home DNA kit. This trend is expected to continue for the foreseeable future and improve the ability of healthcare industry participants, from doctors to pharmaceuticals and medical device manufacturers, to better diagnose patients and develop new treatments. As massive amounts of genomic data are sequenced and analyzed at decreasing cost, scientists should have plenty of opportunities to discover the genetic causes of illness and develop innovative, customized methods to treat them. To continue learning what makes genomics a powerful theme, read Part 2 of this series, which focuses on genomics subsectors and the science behind them. 1. NIH. “FY 2016 Budget Roll-Out.” Feb 2, 2015. 2. WIRED, “Gene Editing is Trickier Than Expected—but Fixes Are in Sight,” Feb 28, 2019. 3. MIT Technology Review, “2017 was the Year of Gene-Therapy breakthroughs,” Jan 3, 2018. 4. Chial, H. Nature. “Mendelian Genetics: Patterns of Inheritance and Single-Gene Disorders,” 2008. 5. Cystic Fibrosis Foundation, “About Cystic Fibrosis,” Accessed Mar 7, 2019. 6. Cure Duchenne, “What is Duchenne,” 2018. 7. World Federation of Hemophilia, “Report on the Annual Global Survey: 2014,” Oct 2015. 8. National Institute of Neurological Disorders and Stroke, NIH, “Huntington’s Disease Information Page,” Jun 15, 2018. 9. NIH, “Rett Syndrome,” Mar 5, 2019. 10. WHO, “Rising cases of sickle cell disease prompts calls for urgent action,” Jul 12, 2018. 11. CrownBio, “PDX and Personalized Medicine,” Jun 5, 2018. 12. 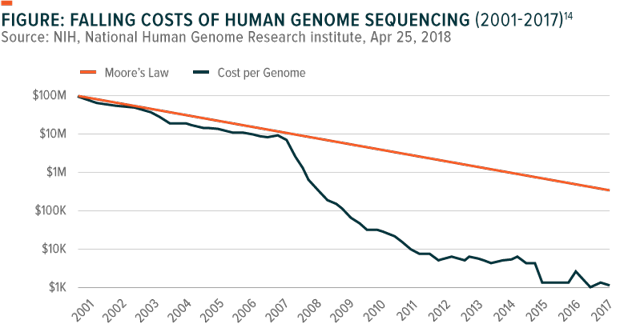 National Human Genome Research Institute, NIH, “DNA Sequencing Costs: Data,” Apr 25, 2018. 13. Elysium Health, “The Non-Scientist’s Guide to Genetic Testing,” May 22, 2018. 15. The Medical Futurist, “The Genomic Data Challenges of the Future,” Oct 27, 2018. 16. Nature, “Genome researchers raise alarm over big data,” Jul 7, 2015. 17. NfX, “The Next Industrial Revolution: Computational Biology & Bioplatforms,” Accessed Mar 8, 2019.